How modern Hall probes work (11 minutes). The Hall effect has been known since the late 19th century, and is the most common method for measuring medium to high fields, for a wide range of applications. 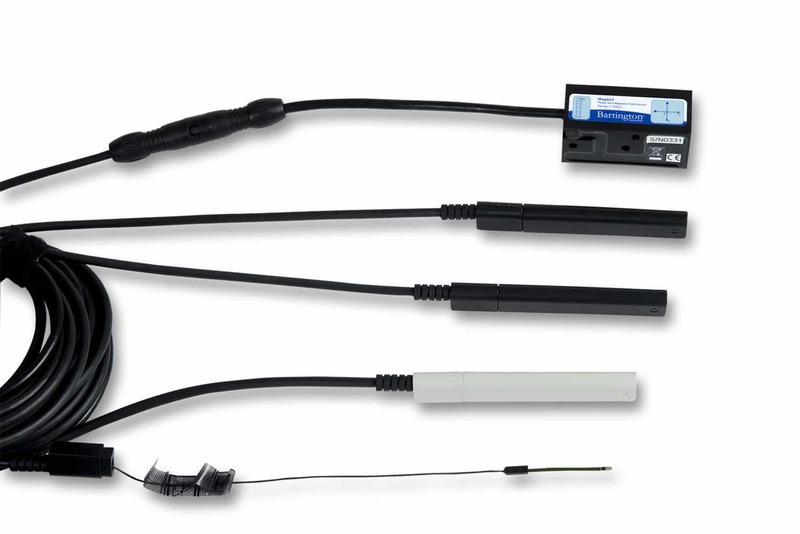 In fact, sensor applications – proximity sensors, rotation sensors, current sensors, etc. – are economically much more important than measurement applications, and have catapulted the Hall element into mass production. A modern Hall element consists of a very thin slab of semiconducting material. If a current is injected parallel to the plate, a perpendicular magnetic field will drive the conductors to the left or right, thus causing a voltage differential between the left and right edges. This process is very nearly instantaneous; one can vary the sensitivity by varying the current; one can measure both positive and negative field components; and it is a simple affair to integrate such a sensor into a fully electronic measurement system. • A Hall element typically generates a voltage offset at zero field. • The sensor response is only approximately linear. • As the temperature increases, more conductors are available, and the device sensitivity changes. • Hall plates also age, causing a long-term sensitivity drift. • The planar Hall effect, whereby a field in the plane of the Hall plate creates a response, causes cross-talk between the vector components of the field. • To the extent that the leads form current loops, moving a Hall probe in a strong field induces a voltage and biases the measurement. • At cryogenic temperatures and with strong fields, the Hall conductivity becomes quantized. To compensate for these physical effects, a Hall device needs to be carefully calibrated, and, to account for long-term drift, it needs to be periodically recalibrated. Assuming the response is linear, the calibration is generally performed at zero and the positive and negative limits of the measurement range. To calibrate at zero field, one can use a zero-Gauss chamber made out of extremely soft iron. For a more precise zero, a coil that exactly offsets the (local) earth’s magnetic field is required. To calibrate the high end of the range, a high-field reference magnet is required. For the ultimate reference, the magnet is controlled or even regulated by NMR. If the response is significantly non-linear, a calibration at one or more intermediate field values is required. If the instrument has several sensitivity ranges, it should be calibrated at every range. To compensate for temperature effects, the entire calibration needs to be repeated at at least two temperatures. And if one wants to compensate for the planar Hall effect or other sources of cross-talk, a very complicated 3D calibration and de-convolution becomes necessary. One source of error escapes the best sensor technology and calibration procedure: angular positioning. Even the best measurement laboratories are obliged to send the Hall sensor on a harrowing journey from calibration jig to measurement jig, with nasty gangs of rolls, pitches and twists just waiting to cumulate at every move. The situation is of course infinitely worse for a handheld device. It is for this reason that Metrolab advocates using three-axis sensors that minimize the loss of information.